For some reason, it´s no longer possible to do a sync with anything else than FTP in my WP-Filebase Pro. This has been so for about 3 weeks. I had a large audio-archive sync with Dropbox, which just vanished on WP-Filebase, and I cant seem to get a new sync established. Is there an explanation for this? John-Peter – Have you installed the Dropbox WP Filebase Extension? 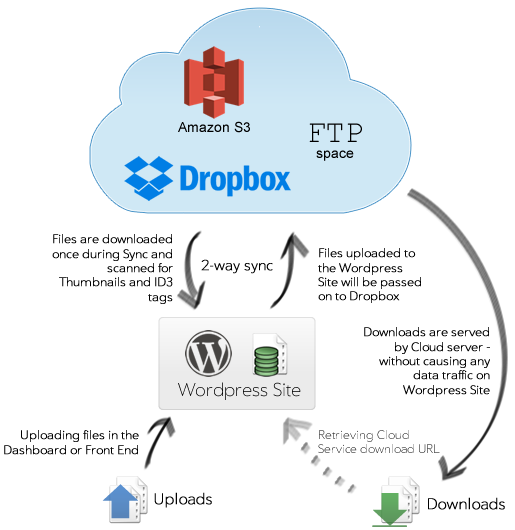 WP Filebase now uses extensions to manage Syncs with various external sources (Dropbox, Amazon, OneDrive). You might need to download an install the extension. All settings should still work, it’s just a case of installing the extension. I am using WPFilebase PRO and extension for Dropbox sync. All my files permissions are set to “everyone” and I have a password-protected page for my files. there is a random problem with authentication token on Dropbox files. Some of the files are not accessible for download. Error 401 coming from Dropbox. When i go to the plugin dashboard and: reset permissions and re-sync with Dropbox it all works again … until next time..
No matter what i try, when selecting FILE URL > Redirect download to URL I receive the error message “Could not get file information from http://file.somedomain.com:888/somefile.zip“. If i upload an attachment directly however it works. Pity because it would have been perfect for this and many other sites. Do other people experience the same problem with File URL? Any idea of what the problem is and how to fix it? Are both the Dropbox extension and WP-Filebase Pro at latest version? I have the latest versions of both WP_Filebase Pro and the Dropbox extension. Any chance of having Cloud Sync to download the files and serve them from the webserver (sideload) rather than the cloud (remove serve)? My users have pretty tight whitelist settings and I don’t want to whitelist the cloud server (onedrive.live.com) all I want whitelisted is my website. But I DO want to be able to use the cloud for myself to create and modify the files. Just want to have WPFileBasePro be the one that’s authorized to go get the files from OneDrive, download them, and then serve them to my website users. Currently its not possible due to low interest in this. However its a planned feature. extention installed. When Menu cloud sync I can not see this, however. I can reconfigure only ftp. What can there be the problem? The files are synchronized and outsourced to another FTP server, GREAT! but what about editing files via media library? How is that affected? Kindly let me know a solution to bypass the virus scanning on Google Drive. I am building a android app and using the final download link to download audio on android phone and having this virus scanning by Google is irritating me! I am looking at using your plugin for a printing company that wants to receive files from their site from clients. Clients will need a login, and thereafter upload to ftp folder (different folder for each client), and thereafter a sync to google drive would be great. Can you let me know if this is possible?